Saturday's spectacular first ski of the season started with a familiar November-day routine for me: pack the car and hurry out the door bright and early, in search of ski-able snow. Destination this time of year: the Whiteface Mountain Toll Road. Even though the twenty-two year routine is familiar, it is never the same. Mother Nature takes care of that. The snow is always different as are the sky, mountain, and lake views. 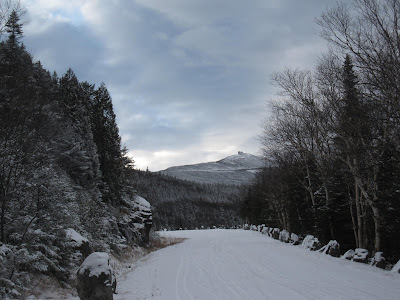 A ski up and down the Whiteface Mountain Veterans Memorial Highway or the "Toll Road" remains one of my favorite Autumn-in-the-Adirondacks pastimes. At 4,867 feet, Whiteface Mountain ranks fifth on the list of New York State's 46 High Peaks. Whiteface is one of the few High Peaks that offers a number of varied recreational uses. Hikers looking to bag a 46er can climb the mountain starting from the Wilmington reservoir or from a trailhead originating on the shore of Lake Placid. Perhaps the most well known and profitable use of this famous Adirondack peak involves the lift-served ski area where the alpine events for the 1980 Winter Olympic Games were held. With the largest vertical drop in the East, Whiteface Mountain also boasts a developed summit with seasonal road access. The Whiteface Castle was built from granite excavated during the building of the seasonal use toll road and today's blog star, the Whiteface Mountain Veterans Memorial Highway. The top of the mountain is a tourist destination in the summer months and features the granite castle and a 424-foot long tunnel into the core of the mountain. From the end of the tunnel, visitors take an elevator to the summit. Both the castle and the road were Depression Era public works projects and may have been a test case for the New Deal Works Progress Administration (WPA) projects that followed. Although not for everyone, the Toll Road ski is one of the best bets for early season skiing because the toll highway closes to vehicular traffic in mid-October, and the asphalt creates a ski-able surface even with minimal snow coverage. A short drive from Lake Placid, the Highway starts at the four corners in Wilmington, New York. The toll house and start of the ski is about three miles from Wilmington, a short distance past North Pole, New York and Santa's workshop. As you can see, the fun starts before you even get to the start of the ski; how often do you get to drive through the North Pole where Santa lives? Here's a link to a photo album of Saturday's excursion. This is an outing designed for your older or more "used" skis. My rock skis and therefore Toll Road skis, are 25-year-old, metal-edged, Karhu XCDGTs. Comfortable three-pin leather boots are perfectly adequate for the descent and make the 5-mile, 9% climb a non-issue, although I saw a few people in huge, plastic, lift-serve boots last Saturday. Although I shirk the added weight of plastic boots, I would not go without the weight of lunch, water, and a thermos of hot tea for the top. The pack also includes a change of base-layer clothing, an extra mid-weight layer, a heavier hat and mittens, and an alpine shell for the ski down. It may seem like a lot of extra clothing, but I skied in 40-mile per hour wind at the top of the mountain on Saturday. With the temperature about 20 degrees and the wind gusts, I was happy to have the extra gear. It takes about 2 and a half hours to ski up to the top, with plenty of photography, water, and gawking stops. After a restorative lunch in the tunnel the ski down is a fun 45-minute ride. In thin snow conditions, one should be prepared to walk in some sections, avoid edging, and ride a flat ski. Falling on asphalt is not recommended.